Maintaining a safe and compliant work environment is an essential component of operational efficiency. 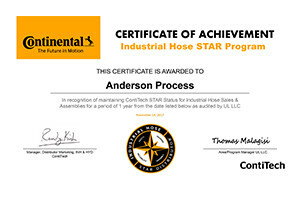 Anderson Process’s experienced liquid-handling professionals have developed pump training and industrial safety certification programs to educate plant personnel about equipment installation, maintenance, cleaning procedures and more. Through these safety-training programs, industrial and manufacturing operations can implement workflow best practices that will help ensure your site is incident-free — mitigating risk, minimizing unplanned downtime and focusing on production output. 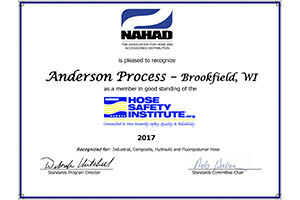 NAHAD — The Association for Hose & Accessories Distribution — is pleased to recognize Anderson Process (Brookfield, WI) as a member in good standing of the NAHAD Hose Safety Institute for industrial, composite, hydraulic and fluoropolymer hoses. Help your team mitigate facility safety risks and enhance your processes. Training programs contribute to employee productivity. Our programs are aligned with common industry certification programs.